Episode 8 opens in Orange County for the first hometown visit. Ben thinks it’s going to be awesome. He meets Amanda (who is wearing a LOT of makeup) at Laguna Beach. They talk about her daughters who are then dropped off at the beach. The little ones are NOT excited about the cameras and become shy. Ben tries to shake their hands, which generally baffles the girls. Because, you know, they’re both under the age of 3. He and the girls chase each other and seagulls. During the drive back to Amanda’s parents’ home, the younger daughter, Charlie (spelling? ), cries for what appears to be the entire car ride. While this is not an unusual situation for kiddos (from what I understand), Ben calls it “rough,” and looks frazzled when he meets the family (mom, dad and sister Carissa). Amanda’s mother is cautious but hopeful after talking with Ben. While she tells Amanda that Ben “could be” the one for her, her hesitation and reservation are obvious. Amanda’s father tries to impress upon Ben that being a dad isn’t just running on the beach (which he’d previously described as a long, overwhelming day). We then see Ben reading a bedtime story to the girls. It’s about Ben and Amanda, which totally won’t confuse small children when he suddenly disappears from their lives. Amanda tells the camera she’ll be heartbroken if she gets sent home. Next up is Portland, Oregon with Lauren B. Their joy at seeing each other is palpable. Lauren B. confesses that she’s in love with Ben and may tell him today. They descend upon a pod of food trucks and began feasting. (After last week’s date at Wrigley, this would be my second choice of Bachelor dates. Food food food.) 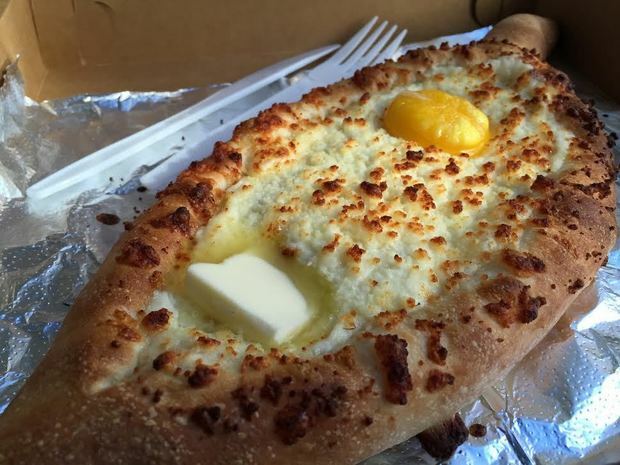 They partake of acharuli khachapuri, a traditional Georgian bread boat topped with butter and an egg yolk. And suddenly I have a new food goal. Find and eat acharuli khachapuri. After eating, they head to the Multnomah Whiskey Library, which Lauren seems to pronounce “liberry”. After whiskey, Ben meets Lauren’s dad, mom, sister Molly and brothers Bryant and Brad. Molly tells Ben she has serious doubts and major questions. She starts with a hard-hitter: “How is everything?” Ben can’t explain why he is attracted toLolo (the family’s nickname for Lauren) and starts crying. Molly is sold. Lolo tells Molly that Ben is “[her] person” and starts crying. Ben tells Lolo’s dad that when he first saw her the world stopped. Dad understands, but still worries that they haven’t known each other long enough to truly know each other. He expresses those same doubts to Lolo. She decides not to tell Ben she loves him yet. Now Ben is in Hudson, Ohio with Caila. 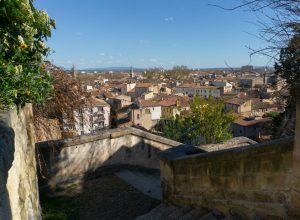 Despite spending all of the episode last week talking about having no real roots and no hometown to speak of, and mentioning it twice already in THIS episode, Caila tells Ben how happy she is for him to visit her home and see where she grew up. (Insert skeptical face here) Since her father is the CEO of toy company, they spend their day first “designing” a playhouse (they color in existing designs), then “building” it (they stand by machines that press plastic into house parts). Caila tells the camera that she knows he’s the one and they’re going to have the happy ever after she’s been looking for. So she’ll tell him she loves him. Right after she gets validation from her family. 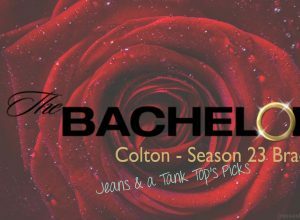 Mom wants to know if there’s more than chemistry, whether Ben cares how Caila thinks and feels. Ben describes how upbeat Caila has been but that she always says what’s real. Caila tells her father that their relationship has been real from the start. Dad sees her emotions as evidence that it is real. Mom asks if its real. Caila tells her that every single moment has been real. She loves him and it’s really real for her. Real real real. Vomit. Now we’re in Dallas, Texas, for JoJo’s cleavage. During the obligatory “walking around my hometown thoughtfully smiling” footage, we see JoJo discover a dozen roses on her doorstep. Assuming they’re from Ben, she starts reading the accompanying letter and realizes it’s from her ex, Chad. She calls him. Turns out Chad thinks their time apart has allowed him to grow and mature. He wants JoJo, and wants to know if she wants him. Scene cut to a crying JoJo opening the door for Ben. She tells him what happened and he gets worried. Then JoJo says she told Chad she was done with him because she is so happy with Ben. He is thrilled. Ben’s introductions to JoJo’s family are overshadowed by the near tackling of JoJo by her brothers Matt and Ben. While initially endearing, it becomes awkward as they refuse to let go of her. It’s like watching two wasted girls who haven’t seen each other in a week and miss each other sooooooooo muuuuuuuch. Ben also meets mom, dad and sister Rachel. Ben tells mom that what sets JoJo apart is that he’s the most himself around her. He tells Rachel he likes Denver but isn’t entirely against the idea of moving. Dad offers the support and friendship of the brothers to help him settle in Dallas. (It feels less like a “hey, we’re all family” and more like a “you will move to Dallas.”) Brother Ben doesn’t think Bachelor Ben is good enough. The brothers pull Bachelor Ben aside. Brother Ben wants to know if he’ll pick JoJo. Ben says there’s a lot of time and he doesn’t know, but they’re in a really good place. Brother Ben tries to get him to make a decision. Bachelor Ben says she’s incredible and it’s real. JoJo tells her mom she’s falling in love. Mom says to jump in 150%. JoJo tells the brothers she’s falling in love. They tell her to stay guarded. Matt thinks Ben isn’t as emotionally invested as JoJo and tells her. 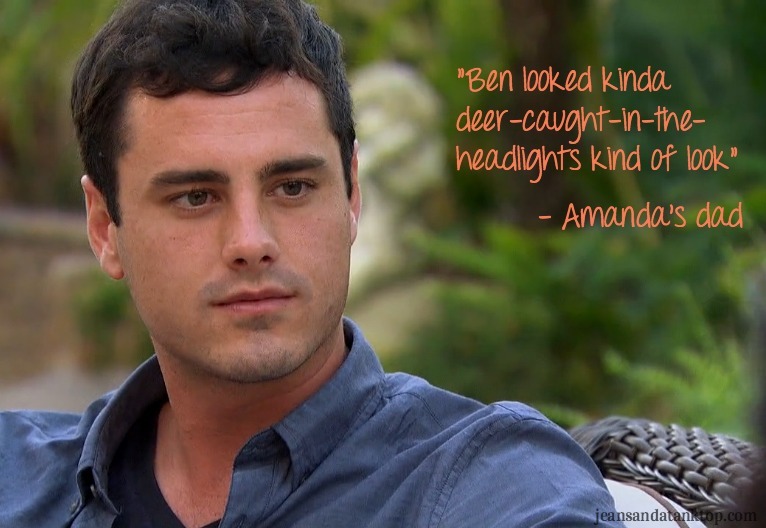 Then he tells Bachelor Ben. In front of everyone in the family… except JoJo. Bachelor Ben tries to reassure Matt by explaining that he cares a lot about her and doesn’t want to hurt her. Matt thinks maybe Ben has been coached and isn’t being truthful. Ben understands their concerns but there’s nothing to do but let time and action tell. Mom swigs the champers and says she feels bad for Ben, which is fair since everyone is sort-of ganging up on him and, again, JoJo isn’t even in the room. Ben is confused by the evening. When JoJo asks how things went he tells her her brothers were being brothers. She tells him the brothers implied he wasn’t as into her as she was him, but does it looking for him to tell her it’s not true. He doesn’t. Everyone flies back to Los Angeles for a rose ceremony at Bachelor Mansion. JoJo arrives in a red dress with a dangerously low neckline. Considering her curves, it should be inappropriate, but it’s not. She looks amazing. Amanda is in love with him and would say yes if he proposed. Caila regrets not telling him she loved him. Lauren is terrified. Ben is tense. Straight to the Rose Ceremony! Chris Harrison interrupts to announce that there is only one rose left. You know, in case 3 minus 2 was too hard for anyone in the room to follow. Amanda is pissed, but tells him its okay. She wishes he would have told her directly after the hometown instead of making her fly to LA for a rose ceremony. In the limo she says she was falling in love with him and could see them getting engaged and possibly getting married. (Definitely engaged but only possibly married?) Ben, standing in the driveway, cries out of what we can safely assume is sheer exhaustion. This week’s bracket score: 15. Total bracket score: 198. Very poor, but I’m still in it! How did you do last night? *Many thanks go to a certain someone at ABC for assistance in completing this post. I bow down to you, Wayne and Garth style.